The Patient Navigation minor is an 18 credit focus of study designed to augment current health care knowledge and provide specialized study in the area of patient advocacy, patient care process and health care navigation. Demonstrate knowledge and skills appropriate for entry-level employment as a Patient Navigator. 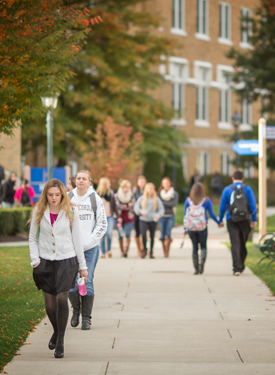 Current students who wish to add a minor in Patient Navigation should contact Dr. Elaine Halesey at 570-674-6480, or email: ehalesey@misericordia.edu. To be eligible for Patient Navigation Fieldwork, a student must have completed all pre-requisite courses; as well as clearances as required by the fieldwork sites and/or the university. These include, but may not be limited to: HIPAA education; drug screening; proof of health insurance; proof of vaccinations/immunizations; criminal record/child abuse checks; federal fingerprinting; CPR certification/re-certification (if applicable); completion of orientation by health care system (if required); and liability insurance. Liability insurance is billed directly by the university, and included in the student's fees included with the tuition statement. Information regarding this fee is listed below under Program Fees. Cost for fieldwork requirements is the responsibility of the student. Fieldwork can only be done during the day, Monday-Friday. Therefore, students must have at least one weekday available during the semester in which they are enrolled in HP 325. Fieldwork consists of 14-15 days in a variety of placements in order to gain a well-rounded experience to understand the role of a patient navigator. Fieldwork may be experienced in a variety of formats over the course of the semester: one day per week for 14 weeks; 2 days for 7.5 weeks, etc. Every effort will be made to accommodate the student's preferred days. Travel to and from assigned fieldwork sites is the responsibility of the student. For students pursuing a minor in Patient Navigation, a fee for liability insurance will be billed in the semester in which the student is enrolled in HP 325. For more information regarding this fee, see the section of the undergraduate catalog entitled Financial Information.